I have played AirMech, on and off, for years. I’ve seen features come and go, the UI undergo massive evolutions. 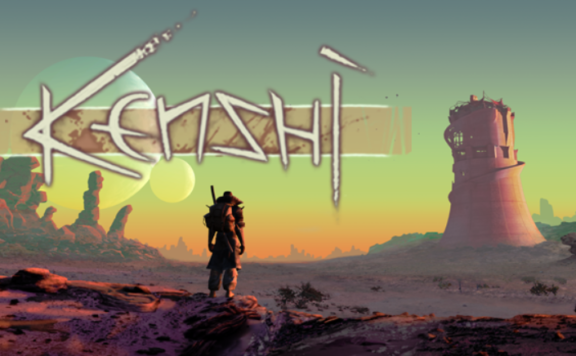 I have played skirmishes and some of the single player content released for that game. Through it all, I’ve remained impressed with Carbon’s dedication to improving the game, experimenting with new features, and just generally iterating on their core vision (the VR AirMech experience is quite fun, even if I can’t see myself playing it for a tremendous amount of time – the controls can be a bit cumbersome, and I find virtual reality a bit disorienting in large doses). 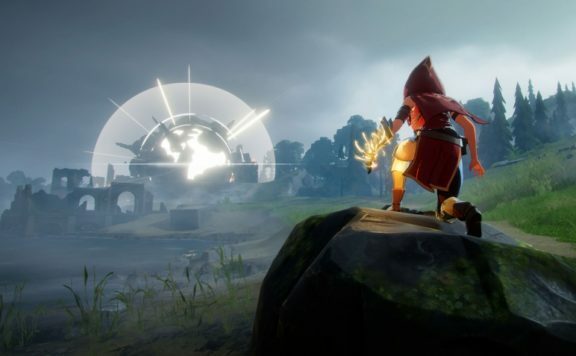 So, of course, I was excited to see that Carbon was coming out with an AirMech ARPG, a supposedly Diablo-style single player experience that would bring people into its universe that might otherwise have passed on it due to the multiplayer-centric core game. 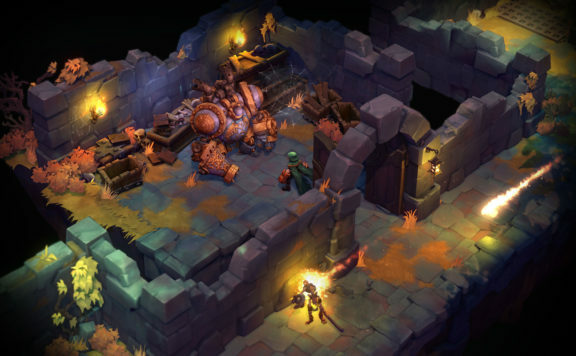 I wondered how they might have altered the model to turn their action RTS into something that felt more like Torchlight. As it turns out, it’s still basically the same messy, fast, fun game. The controls are the same, the production and control of units are (mostly) the same. Bases are handled the same way: in fact, the games are so similar, players’ accounts are synced between the two: unlocked/purchased AirMechs, pilots, unit types, cosmetics, and gear are shared across both titles. Gear is a relic of an older version of AirMech: I don’t think it’s present in Strike, the current incarnation of the competitive game. 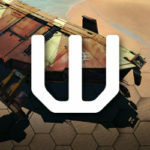 At their core, both AirMech Strike and AirMech Wastelands are real-time strategy games, albeit non-traditional ones. 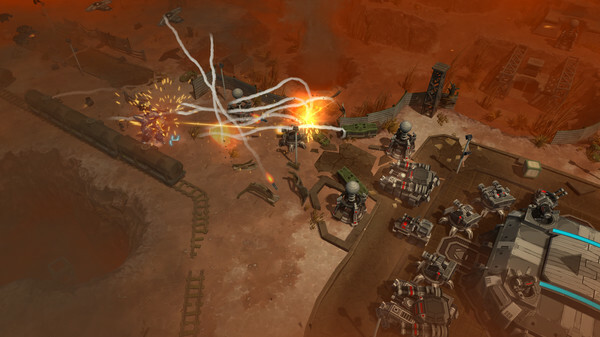 In the style that’s come to be associated with ARPGs and MOBAs, the player in AirMech Wastelands directly controls their titular unit (the AirMech) via W, A, S, D movement and attacks enemies via mouse clicks that cause the ‘mech to fire in the direction of the mouse cursor. Players can also build and issue orders to semi-autonomous units via keyboard controls. This isn’t StarCraft where you’re twitch-microing individual marines away from banelings: the only things you have direct control over is your giant flying, transforming robot. But managing your units is a major part of the game, and shouldn’t be discounted. 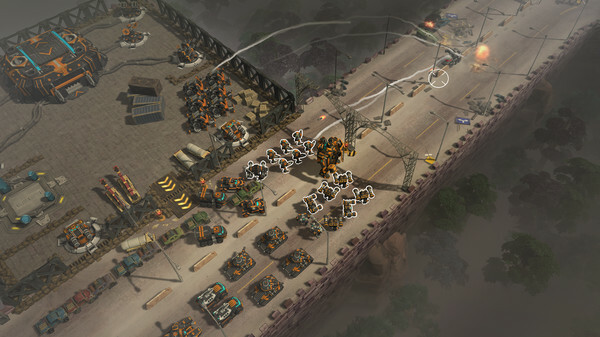 AirMech Wastelands might be calling itself an RPG for marketing, but its soul is that of the action-RTS that this series is known for. The series has been around for a while, but for those unfamiliar or new to the concept, allow me to explain it briefly. 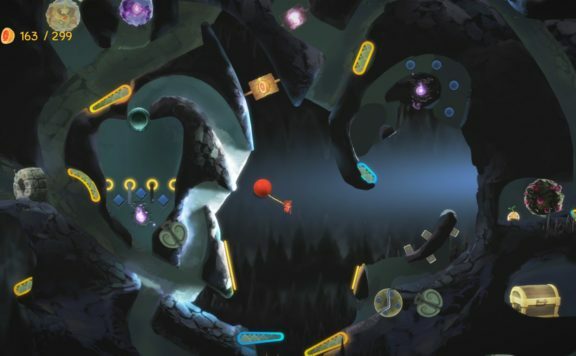 The player controls what is essentially an aircraft, that flies around the map. 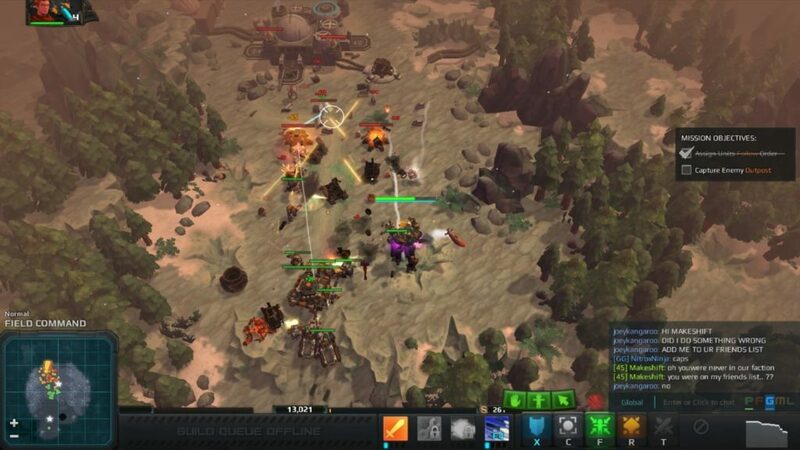 In this mode, it can transport the above-mention units around the map, and attack air targets. With the press of a button, the aircraft ‘unpacks’ into a (usually) bipedal, humanoid walker mech. These mechs are broken up into ‘classes’ similar to what you might be familiar with in an ARPG like Diablo, or like you’d see in a MOBA. From the Paladin, which has auras and throws a hammer at enemies, to the Saucer, which can teleport, mind control enemies, and has a death ray, to the Bomber (which, needless to say, can drop bombs on enemies while in air mode) each class has unique features and abilities both in air mode and ground mode. One of my personal favorites is the Saucer, which is a highly Energy-dependent specialist. The Osprey, which is mostly focused on managing its army, is another I’m fond of. 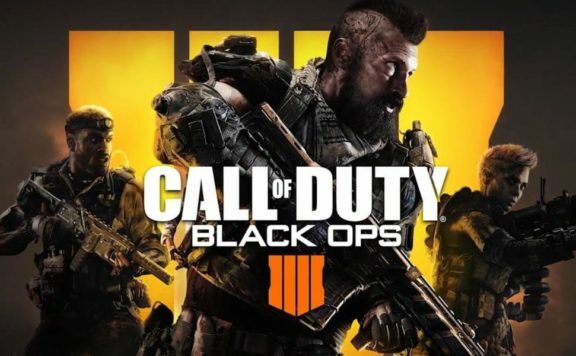 The core game is split into multiple discrete, but interrelated parts: First, there are single player or co-op missions. 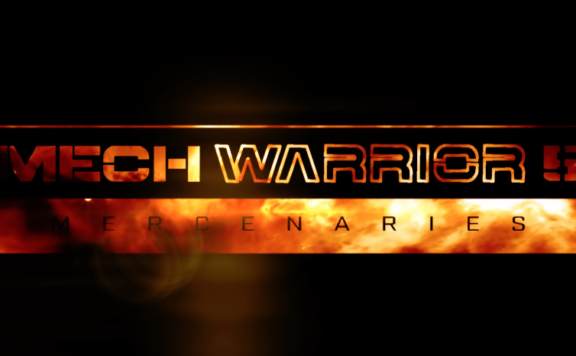 These range from single player bullet-hell style shoot em ups, to traditional AirMech matches. There are maps where you have to defend and hold bases while a timer ticks down; there are a horde mode and a number of ‘challenge’ maps. These missions are represented as pins or locations on a massive overworld, which is the second major part of the game (seen above), where your ‘mech flies around from place to place, directed by the progression of the plot but allowing you to replay old levels, side-track into optional content, or even visit shops where you can purchase gear, unit types, and upgrades. Something quite cool about the overworld map is that you can see other players’ mechs flying around, going into missions, et cetera. 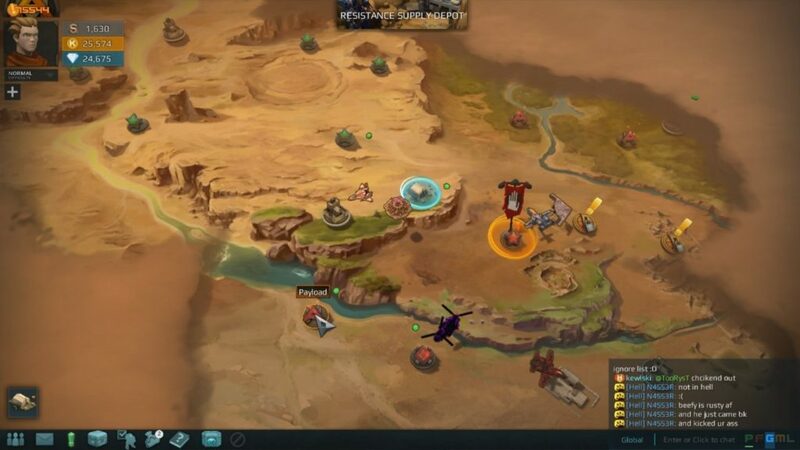 There’s global chat, synced with that of the other main AirMech game, where you can coordinate with other players to do co-op content. It’s a really nice touch, seeing other players interacting with the game. It makes it feel more alive. 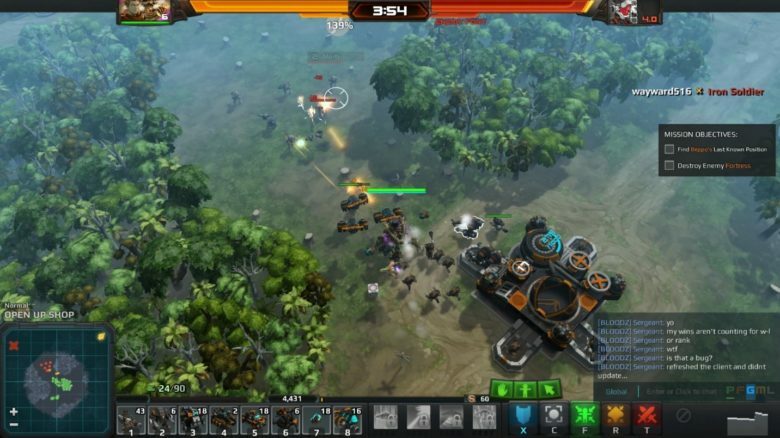 In previous versions of AirMech (which is now called AirMech Strike), you could install various upgrades into your AirMechs – some of them were class specific, and some were generic. They’d provide incremental increases or decreases to things like unit build time, carry capacity, movement or transformation speed, et cetera. This brings me to the 3rd major aspect of the game: the various stores, menus, and loadouts that you’re asked to manage and interact with. This is, unfortunately, the weakest aspect of the game in my opinion. I love the idea of managing loadouts: tweaking your walker’s gear to optimize your play style is up my alley. That, I have no particular problem with (though I found the UI to be mildly buggy and sometimes obtuse – where do I go to pick my currently active AirMech, again? Where do I go to design unit loadouts?). These things can be taught, but the occasional mental stuttering that the game causes can be frustrating. My problem lies more in the realm of the game store. 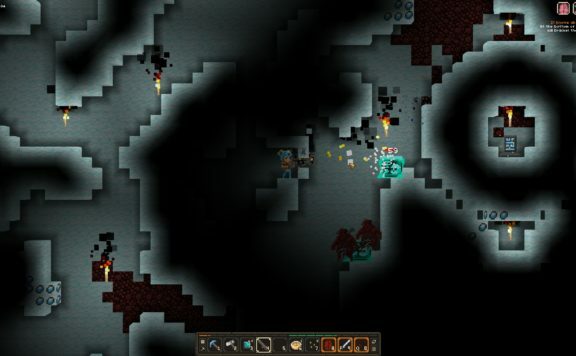 While AirMech Strike is free to play, with a $20USD package that serves to unlock the game’s core content, AirMech Wastelands is an up-front purchase, and the game’s stocked store can be a bit confrontational when you dip into it to browse around. I have personally purchased Diamonds from Carbon, and have used them to unlock content, but the feeling of pressure to do so sits oddly in a premium game. Gear (some of which unlocks abilities in this game) is level-locked, and levels are purchased via coins. Gear is itself purchased via coins, which leads to the temptation to continue to pay into the game to increase the rate at which you gain access to content. Fine by me in a free-to-play game, but a weird bit of cognitive dissonance in something you’ve shelled out for up front.